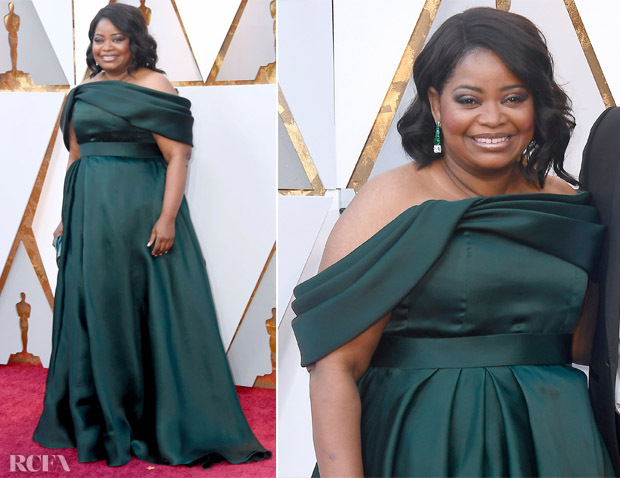 Octavia Spencer attended the 2018 Oscars in Los Angeles on Sunday (March 4) along with a host of her peers. The actress wore a custom Brandon Maxwell gown with coordinating emerald jewels. This color is such perfection on Octavia that I may just start a petition for her to never wear anything but emerald green again! I also simply love the way the pleated necklace lays to create slightly asymmetrical sleeves. A perfect wavy bob and smokey eye and of course, Octavia’s radiant smile, complete the look.